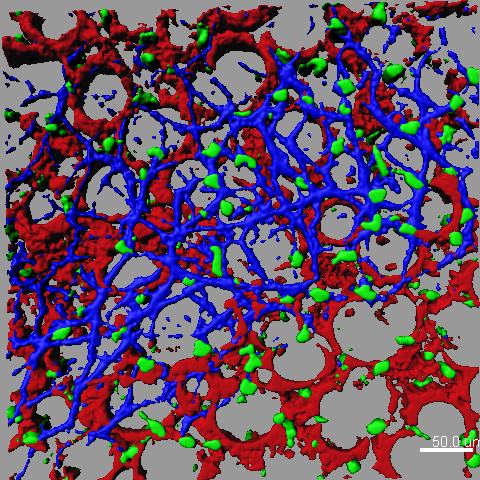 Isosurface rendering of a lung multiphoton picture showing IL33-expressing cells (green), blood vessels (red) and collagen (blue). Emma Lefrançais, postdoctoral researcher in Jean-Philippe Girard laboratory has received a three-year grant from the Fondation pour la Recherche Médicale to study the cellular dynamics of respiratory allergies using to lung intravital microscopy. Multiphoton microscopy enables the deep observation of a live tissue (several hundred microns) at high resolution. Intravital imaging is one of the most powerful approaches to study dynamic processes during infection or inflammation and allows to observe the lung under physiological conditions (maintaining the circulation and the pulmonary microenvironment). However, dynamic and in vivo monitoring of the lung at the microscopic scale requires the development of techniques to stabilize the organ. Without these techniques, intrinsic movements due to breathing and cardiac contractions unacceptably alter the acquisition of precise images over time. The lung intravital imaging technique developed by M. Looney and M. Krummel at the University of California at San Francisco (UCSF) (Looney et al. 2011 Nat Methods) overcomes these challenges and reveals knowledge inaccessible through other methods. Emma Lefrançais has acquired this technique during her postdoctoral studies and thanks to the support of the FRM, she is setting up this advanced technique at IPBS. Her project investigates the cellular dynamics involved in asthma and more specifically the cells activated by interleukin-33 (IL-33), a molecule that plays a crucial role in this pathology. The IPBS Imaging Core Facility TRI-IPBS, part of the TRI-Genotoul Platform, is equiped with two multiphoton microscopes including one in a BSL3 environment that enables in vivo imaging of pathogenic agents (Barlerin et al. 2017 Sci Rep). Hence we are able to visualise cell dynamics during viral exacerbations of asthma. Indeed respiratory viruses are known to be the cause of the most serious asthma attacks.